More than 200 years ago, fifty-five men assembled in Philadelphia to ensure the blessings of liberty for themselves and for posterity. It was a goal of incredible ambition. No democracy in history had survived the failings of political reality. In fact, the men gathered in Philadelphia were brought together because their own dearly-bought freedom seemed imperilled due to fracture amongst the states. To the surprise of many, these men from all stations and all walks of life produced a unifying document that has endured. The names of many of the delegates have become unfamiliar; their images - if preserved at all - exist sometimes as solitary portraits staring out from the depths of history. The best-remembered among them have been immortalized in cold marble. There is no film, no audio, and no photography of these men at their task. Yet their intentions, their arguments, and their expressions remain the heart of the American political experiment. 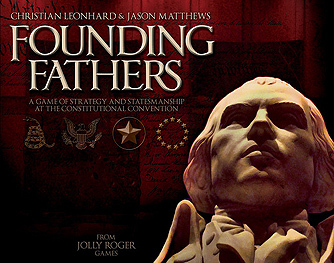 Founding Fathers is a game that invites you to bring this critical juncture in American history back to life. Using a card-driven game system, players assume the role of one of the delegates with a plan to create a new government. Your task is simple: exert the most influence on the outcome of the new Constitution. You must act upon the state delegations, your faction, the committee process, and the deliberations in the Assembly Room, all with the goal of creating a more perfect union between the states. Historically, James Madison is remembered as the Father of the Constitution. Now, it's your turn... and won't you look great in marble?